Three New Handsets For India – LG KF510, LG KP320 and LG KP110. LG have announced that they will be launching three new models in our markets. 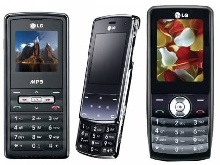 The three models would be LG KF510, LG KP320 and LG KP110. They would be additions to their fairly popular music oriented series, the Dynamite series and the low end editions which they have plethora of devices actually. The KF510 which seems to be in the limelight is actually a music oriented handset. It has a 3MP AF flash camera along with red eye reduction and image stabilization. It has GPRS EDGE for connectivity and Bluetooth and FM radio. Also present is MPEG-4 player and dedicated MP3 player. Besides all this the fruit on the cake is that it can record video in QVGA resolution and also play back. Targeted at style oriented customers, the 10.9mm thick KF510 is also equipped with a touch sensitive navigational keypad. Its 2.2-inches 240 x 320 pixels LCD display is covered by tempered glass and features a light sensor on the front in addition to power-saving auto-luminance control. The new member to the Dynamite series clan, LG KP320 features a 3 megapixel camera with auto focus, video-recording, speaker phone, document viewer, email and Internet capabilities and high internal memory with TV out feature. Targeting the youth and mainly young women, the phone measures 107 x 46 x 13.5 millimeters and weighs just 81 grams. Moreover, the phone has 2 inch TFT display with 262k colors back up, music and video player, FM radio and Bluetooth. The low end newcomer, the ‘extremely lightweight’ KP110 is an expansion of LG’s Bullet Series, which saw tremendous success amongst first timers and college students. The phone targets first-time phone buyers inclined towards music. Additional features of the phone includes MP3 player, FM radio on speaker phone; the ability to store around 500 phone numbers and 500 SMS messages, expandable memory up to 2GB; GPRS and WAP connectivity; and battery life up to 4 hours of talk time, 400 hours standby time and many others. “KF510 is an exceptionally slim slider phone; KP320 comes with advanced features and is economically priced; and KP110 is a fully loaded music phone. These handsets have been launched to delight our consumers across various consumer segments suiting every budget requirement,” Mr. Arora added. 12,250; Rs 7,990; and Rs 2,899 respectively.